The electric revolution just got more interesting. Especially for those who love to go on off-road adventures behind the wheel. Introducing B1, the world’s first all-electric sport utility truck. 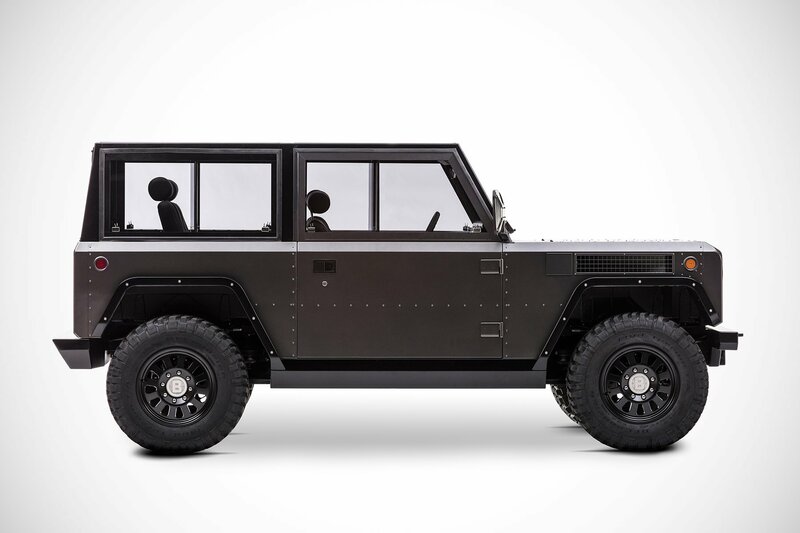 Developed, designed and made by Bollinger Motors in the picturesque Catskill Mountains of upstate New York, the B1 electric truck fills a void in the market. And it looks ready to take on the role in style. Minimalist and rugged, the truck has a simple, no-nonsense design that’s all about function and versatility. The boxy shape, clean lines, rivet details, and wide, 33 inch tires give B1 a heavy-duty look and feel. Practical features include a winch on the front bumper, 15.5 inches ground clearance, as well as removable back seats, rear windows, doors, and roof. The removable parts allow the owner to easily transport skis, a surfboard, long planks, or plywood sheets. In terms of power, the truck impresses with a dual-motor drivetrain, 472 lb-ft of torque and 360 hp, making a 0-60 miles per hour sprint last just 4.5 seconds. The standard 60kWh battery has a 120-mile range, while the optional 100kWh one reaches up to 200 miles. Understated and simple, the waterproof cabin features a small LCD, an analog battery level indicator, a marine radio receiver, Bluetooth connectivity, an AUX input, and USB and 12-volt plugs. Bollinger Motors plans to enter the manufacturing stage soon, pricing B1 at around $60,000. Currently a prototype, this all-electric all-terrain sport truck can be reserved now, free of charge, on the company’s official website. Those who wish to complete their orders in early 2018 will have to make a $1,000 down payment to secure their place in line. Photographs© Bollinger Motors.